Help your family discover the joys of being British when the movie Paddington opens on Friday, January 16th. Based on the beloved book series about a talking bear discovered in London's Paddington Station, this well-crafted movie is visual story telling at its best. The slapstick plot is quirky and fun. The acting chops of Downton Abbey's Hugh Bonneville and the great Nicole Kidman are on full display. The character of Paddington himself combines a warmly acted voice-over with beautifully drawn animation. The standout feature of this movie is the unique cinematography. Moviegoers are treated to a full tour of London. The still shots between scenes are so beautiful, I felt like I was actually turning the pages of a story book. Visual puns are everywhere. Because so many of the movie's jokes are visual, there is a special sense of community when an entire theater of children and adults laugh together in unison. 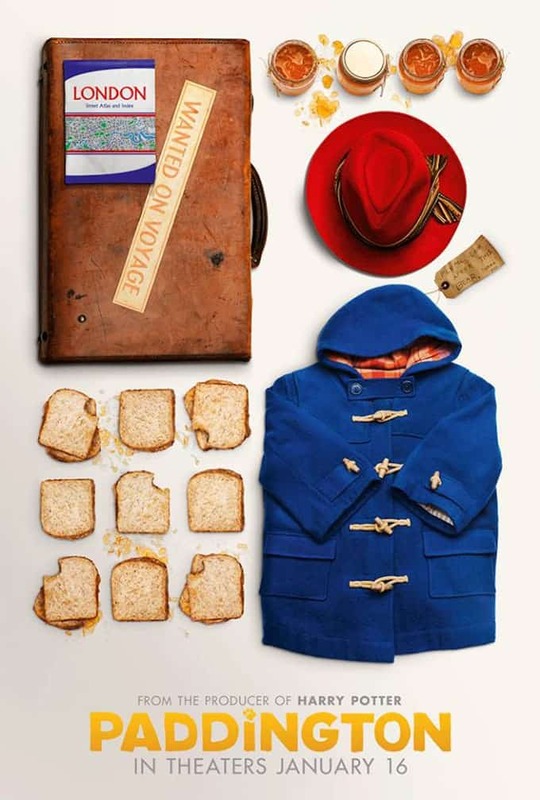 For example, Paddington is a bear who always wears a marmalade sandwich under his hat "in case of emergencies." Paddington kindly offers to share his marmalade sandwich with a single pigeon, only to become flustered when an entire flock shows up to demand their share. In another scene, Paddington leaves behind his adopted family and lingers alone in front of Buckingham Palace. Paddington takes off his rain soaked hat and starts to mournfully eat a soggy marmalade sandwich. Suddenly, a thick club sandwich with an English royal crest appears in front of him. The Palace Guard has taken pity on poor Paddington. The Palace Guard then removes his tall Bearskin hat to reveal a tall thermos balancing perfectly on his head. These witty British jokes are what makes Paddington a cut above the normal family movie fare. Paddington drinks tea at "elevenses" and informs us that the British have over 100 words to describe rain. Paddington is a well mannered bear who tips his hat while accidentally stealing a dog in order to ride an escalator for his first time in the London Underground. The movie Paddington carries some gentle messages inside its jokes. Families should stick together. A bear will increase the likelihood of property damage by 4,000% percent. To welcome a stranger is an act of charity that never goes unrewarded. Thanks to Allied Faith and Family, I get to share the joy of Paddington with my readers! I have 2 Paddington Bear stuffed animals to giveaway. To enter this giveaway, please click on the raffle entry below before Saturday, January 17, 2015. Enjoy! (Winners will have an American address only, please).